And boy am I loving Ai Xing for standing up to Jing Jing. It’s about time someone tried to knock some sense into her. Jing Jing vowed to leave Tian Ze alone so he can be happy, but she can’t stand for him to be happy without her. Jing Jing likes to says that none of this was her decision, but wasn’t all of it? Sure it was Ren Wei’s decision to pursue revenge for his dead family not knowing everything. Sure it was his decision to try to use his revenge to score the woman he loves, but I honestly think he might have backed off or changed tactics if Jing Jing hadn’t make her own decision. Oy. Jing Jing saying that she only broke up with Tian Ze to save her family and Jing Jing saying she only agreed to marry Ren Wei for her mother. This girl is not taking responsibility for her decisions or actions. My sophomore US History teacher would be livid (she had posters saying “Ignorance is NOT bliss” and “I am responsible for my own actions” all over the classroom). Oh, and the previews! The previews! I can’t tell if Tian Ze officially has his memory back or not, but it was really awesome the scene they showed between him and Jing Jing. I think that her argument with Ai Xing at the end of this episode, plus her little tiff with Tian Ze in the next episode (can’t guarantee that as they tease you several episodes in advance sometimes) might finally bring Jing Jing to her senses. Thank you, Tian Ze. For you, for Grandpa and Zhi Xing, I’ll definitely work hard to become a top salesperson. Then I’ll buy us a house in Taipei. A place that belongs to us. At work, Ren Wei rushes in to find Ai Xing, ignoring Ling Li’s calls and gives a 90° bow as he apologizes. This shocks everyone, even Ai Xing. Before Ren Wei can utter just WHY he’s apologizing, Ai Xing clamps his mouth shut and pulls him into another room where he bows and apologizes yet again. Nice. I like that he didn’t even have to be told that what he did was wrong and that he should apologize. He did so because he felt awful and he should not have used her as a replacement. Ai Xing then says that he should apologize in a gentler way and after he does. Ai Xing says that a simple apology cannot replace her first kiss. Ren Wei is shocked to discover he stole Ai Xing’s first kiss. That’s even worse. He goes to say he’ll take responsibility, but how so? Ai Xing then torments him about giving her money, a better commission rate, before finally settling on making him her chauffer for the day. So Ai Xing has Ren Wei take her to the airport to meet a famous artist that Zhi Xing loves. Ai Xing greets the man, Wang Da Chuan, and then has the disbelieving Ren Wei takes his bags as she pulls Da Chuan out to the car. It looks like she is serious about getting Zhi Xing the instruction he needs so that his works will be able to be displayed in an art gallery on their own someday. Da Chuan does not want to take on any students. He has never had students in the past, nor does he want any now. He is back in Taipei for some R&R. Ai Xing won’t rest until he agrees to teach her little brother. She stakes out his apartment until he calls security and has her thrown out. While all that was going on, it’s a Du family reunion as Mr. Du has finally arrived back in Taipei. He is shocked when his son greets him with a hug. Grandpa motions to his head that Tian Ze is not quite right. Mr. Du is very apologetic that he wasn’t there when Tian Ze needed him the most and he thanks Grandpa for taking care of his son the whole time. Mr. Du then states that Tian Ze’s injury has made him more responsible and mature it seems. Tian Ze then asks if he was very troublesome before. Grandpa agrees that Tian Ze was a pain as well as Mr. Du. Tian Ze then shocks his father by asking if he can work in his law firm. This shocks the hell out of Grandpa as well. 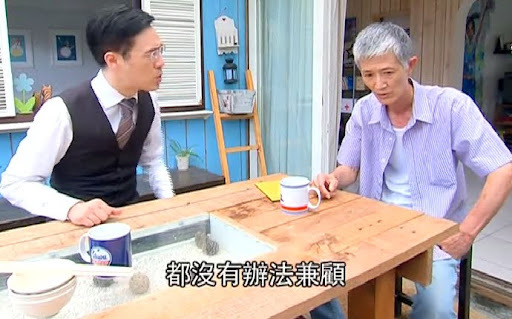 Tian Ze tells his dad that while his memories may be missing, he still can remember all of the laws and articles. This makes Mr. Du really happy and he quickly agrees to Tian Ze’s request. Grandpa interjects, however, that he hasn’t consented. The two wait expectantly and Grandpa actually agrees to this arrangement as it just might help get Tian Ze’s memories back. Grandpa and Mr. Du sit down while Tian Ze prepares some snacks. Mr. Du hands over an envelope which Grandpa refuses. Mr. Du then wonders what he can do since his father won’t accept anything from him so that the only thing he can do is give money. Du then begs for a fresh start from his father. True, Tian Ze has forgotten the painful past, but he’s at least opening up to his father now with love. Can’t Grandpa do the same for Du? Grandpa then lays down just why he’s upset and why it cant’ be all forgive and forget. Apparently Du was once a DA and prosecuted his own father-in-law. After the case was over, he stepped down from being a DA and became a private lawyer for rich clients as well as a professor. He then started a relationship with one of his students. Grandpa cannot approve of that. Du says that things aren’t that simple. The rich aren’t always greedy and wrong (true, poor people can be bad as well as rich) and his broken relationship with his wife happened before he started the affair. Tian Ze comes out with the dishes, but forgot to make rice, so Grandpa takes Du’s money to go by some instant rice at the local store. It gets late and Tian Ze gets worried as Ai Xing isn’t picking up her phone. He then scrolls through his contact list and contacts Ren Wei who happily supplies him with the information about Ai Xing’s whereabouts. Tian Ze goes to Da Chuan’s apartment and scolds AI Xing for making him worry. Awww, so sweet. This coming from the guy who didn’t seem too concerned when Ai Xing stayed out all night in a previous episode (although he did let her have it later). Ai Xing is sorry that he worried, but she can’t give up. She must make sure she gets the best teacher possible for her brother. Tian Ze then takes her fliers and writes a message saying that if the artists (who is more reclusive) doesn’t want the press to know he’s back, then he needs to meet with Zhi Xing. Da Chuan reluctantly agrees to the meeting when he unfolds the paper airplane in his living room. The next day Da Chuan takes a look at Zhi Xing’s work and is impressed. With some help, Zhi Xing could surpass him one day. Zhi Xing doesn’t want that, but he’s happy to be able to draw with his favorite artist “forever”. Ai Xing explains that they always moved around when they were kids so they never had any real friends or home, that’s why permanence is a big deal to Zhi Xing. Ai Xing then asks about Da Chuan and if he doesn’t crave such an environment. Da Chuan says that he doesn’t. He then admits to having a woman, but she left him and married another man. Okay, radar tingling again. Da Chuan’s art and Zhi Xing’s art are quite a bit alike. Da Chuan emigrated to the US as well. So what the heck. But then again…I wonder if Mrs. Zeng, the Mengs and Da Chuan were in a complicated love square (much like the children are right now)? It’s suspicious. Highly suspicious. Grandpa is putting clothes away in Ai Xing’s room when he spots her red diary. He proceeds to pick it up and read it just as Ai Xing and Tian Ze come home. Grandpa demands to know just what is between Ren Wei and Ai Xing. The young woman replies they are only employer and employee. If that’s the case, then why did they kiss? Tian Ze, hearing that Ren Wei kissed Ai Xing, runs off. Ai Xing runs after him and follows him all the way to Ren Wei’s place where he rings the bell, punches Ren Wei and walks out. AI Xing follows him again and says it was all a misunderstanding. Ren Wei was mad at Jing Jing and kissed her and thus it was just an unfortunate accident. Tian Ze says that isn’t important, what’s important is that no one should treat AI Xing, his most important person, that way. Ai Xing, touched and also very insecure, demands to know how TIan Ze knows she’s so important to him. Tian Ze replies that he may have forgotten his memories, but his heart and body didn’t forget. He always goes to Ai Xing’s place, always looks for her when he is happy or sad. These feelings equate to love, don’t they? Finally! Tian Ze understands as an amnesiac what he couldn’t when he had all of his memories. Ai Xing is frightened as she is falling deeper and deeper for him. She then makes Tian Ze promise to not hate her, no matter what happens in the future (meaning when he regains his memories) and he swears he can’t hate her. Later Ai Xing is trying to get a certain Mrs. Liu to buy some real estate from her and thus becomes her errand girl (much to Ling Li’s horror as sales people have pride and standards, too). Tian Ze is supposed to start work at his father’s office, but his suit is at the cleaners. She then calls Jing Jing in to help. Tian Ze asks about the past and if they were friendly. Jing Jing replies that they are all three good friends. Ai Xing and Tian Ze are the sky and clouds while Jing Jing is the sun (reversing their earlier positions). Tian Ze wonders if he was bad in the past as he may not remember, but he understands that AI Xing and Grandpa are only telling him the good things. Yep, Tian Ze is a sharp cookie. Jing Jing says that he was very good and passionate and persistent in love. She then tells him that he’s much happier now than before and that he shouldn’t doubt his past and just focus on the present and heading in the right direction. She says this, but you know that deep down, she really doesn’t want him to let go of the past and I am sure she is actually unhappy that Tian Ze is happier without her in his life. Ren Wei is just leaving Mr. Du’s office when Jing Jing and Tian Ze walk in. Like always, Ren Wei is not happy to see the two together. Jing Jing then invites Mr. Du and Tian Ze to the wedding in a month. 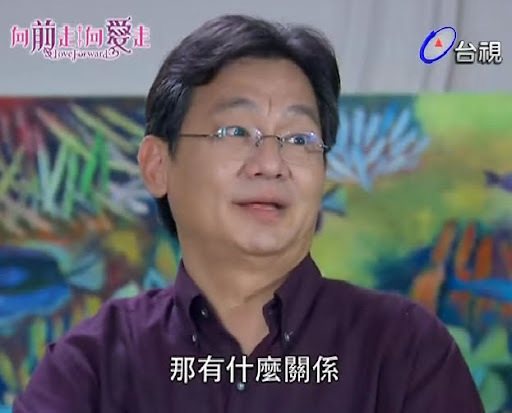 Mr. Du, who was about to say that he knew Jing Jing because she was his client’s daughter and Tian Ze’s ex, is surprised, but happily agrees to attend the wedding. Much to Jing Jing’s dislike, Tian Ze promises to attend with Ai Xing as well. She leaves followed by Ren Wei who says that she obviously still loves Tian Ze. Well, it’s not like that can be shut off immediately over night. Okay, while Jing Jing is not technically wrong, I have to say that she isn’t right either. Yes, getting over him doesn’t mean forgetting the past and yes, it will take time to recover, but she can’t recover if she refuses to let go of the past. Letting go and forgetting are two very different things. She needs to let go so she has a chance at happiness with Ren Wei, but she’s not letting go. In fact, she plays at letting go while holding on tight to those precious memories that Tian Ze has forgotten. Tian Ze is introduced to the lawyers at his father’s firm. They have been apprised of his memory situation as Gao Yuan asks if TIan Ze doesn’t remember who he is. Tian Ze does not remember his good friend, but that doesn’t matter as Gao Yuan promises to cover for him if he has any problems. Mr. Du and Ms. Zhu then show Tian Ze to his office. Tian Ze asks for past case files and Mr. Du is livid when the Mei Ze files are brought in. Is his girlfriend trying to lose him the son he just got back? Zhu is angry that he thinks that. The Mei Ze project is famous and high profile so there is no way to keep it from Tian Ze. She then decides to leave Mr. Du if he still cannot trust her after all of these years together. The worried Tian Ze then calls Ai Xing who is supposed to be doing even more running for Mrs. Liu in order to get her to sign the contract. However, Ai Xing chooses the worried Tian Ze over work. She rushes to the Du house to stop Zhu from leaving. You can see how much she cares for Du as she tells Ai Xing about Du’s health problems and what he can and cannot eat. Du comes home and says that she can leave if that’s what she wants. But before she does, Zhu has to tell Tian Ze about his mother. When Du prosecuted her father, she threatened to kill herself and Tian Ze. Thus Du sent her overseas to recover and she still took her own life. He then played the bad guy so Tian Ze wouldn’t think poorly of the mother he loved so much. Okay. Pause. I am not saying that Mrs. Du was not wrong for threatening to take her and her son’s life, but nor is Mr. Du innocent. He should have stayed away from the case since it involved his father-in-law and let another DA prosecute it. I mean, his wife probably still would have been unhappy since he didn’t save her father, but still, the breakdown might not have happened then. Anywho, after this all gets out in the open, TIan Ze and Ai Xing encourage Zhu and Du to make up and stay together and they do. This scene? As much as it was meant to be touching, was rather trite and unbelieving as much of these types of scenes are in this drama. The main focus here is that you need to confront the truth and the past. So when will Tian Ze do just that? I mean, in a way, he’s overcoming some of the obstacles from the past while in amnesiac mode, but at the same time, since he has no memory, can it really be called confronting the past. He really needs to figure things out and then decide to move on with Ai Xing or pine away. Ai Xing rushes back to work on Mrs. Liu and Tian Ze catches sight of Jing Jing on his way back to Ai Xing’s apartment. She is at their bank. She is happy thinking that he remembered, but he didn’t. The two then sit and chat much like they used to when they realized almost all the things they had in common. Tian Ze states that if Ai Xing wasn’t cuter, he might have fallen for Jing Jing instead. She responds with that if he was a little handsomer, she might have fallen for him instead of Ren Wei as well. This conversation also brings them back to the topic of being fated. So many people just miss each other, but they seem to always find one another. This reminds me of the fortunetelling where the scammers told Grandpa that Jing Jing and Tian Ze are fated but not destined. They are fated to always meet, but destined to never be together. It’s OK, I understand. Women are usually more practical, but men’s pockets are different from their hearts. You can’t judge its depth. No one can tell which pairing in love is right—you are the only one who knows. Tian Ze returns to Ai Xing’s home instead of moving back in with his father since his dad and Zhu are back together again. Tian Ze doesn’t want to be the third wheel. We then get this really great confession and promise from Tian Ze to Ai Xing (with a little coaching from Grandpa Du of course). We then get to see Tian Ze picking Ai Xing up from work. She gets on the back of his scooter and is in utter bliss. Her happiness is tampered by the thought of what will happen when she must give Tian Ze back to Jing Jing. In the next thought, she does remember that Jing Jing is marrying Ren Wei, so Jing Jing can’t have Tian Ze anyways. Mr. Du does finally clear Tian Ze to look at the Mei Ze case and Tian Ze begins to wonder just what happened between himself, Ai Xing, Jing Jing and Ren Wei. He thinks hard. Will he remember? While he’s trying hard to figure out what happened, Jing Jing is talking with Ai Xing. Jing Jing is getting rather angry and jealous as Ai Xing is taking that which belongs to her—the breakfasts, the rides to work, etc. Ai Xing then asks how things are going with Ren Wei. Bad topic apparently as Jing Jing says that things are always be the same. Ai Xing then says that it seems like Ren Wei really likes Jing Jing. The other girl snaps. If Ai Xing likes Ren Wei so much, why isn’t she with him instead (did you miss it when Ai Xing said that Ren Wei likes you?”). Jing Jing then says that Ai Xing is using this to assuage her guilt so she can be with Tian Ze. Ai Xing brings up that Jing Jing told her to take care of Tian Ze. Jing Jing then says she said to take care of him, NOT fall for him. Yes, I shouldn’t have. But why can’t I fall for Tian Ze? Why do you always come and go as you please? Why do you always hurt him and I have to pick up the pieces? Jing Jing is shocked by this sudden tirade from Ai Xing. I am happy that Ai Xing finally stopped apologizing for loving Tian Ze like it was some kind of crime. I am also happy that someone is finally trying to put Jing Jing in her place and give her a wake up call. Jing Jing then refutes what Ai Xing said. She never came and went as she pleased. She left Tian Ze because of her family’s debt and chose to be with Ren Wei to save her mother. Heck, she is even playing along with everyone to help Tian Ze regain his memory. When did she come and go as she pleased? She didn’t have to break up with Tian Ze because of her family’s debt. That was her decision. She could have remained with Tian Ze while trying to help her dad pick up the pieces of the company. Her mother was going crazy trying to find money to keep Jing Jing from marrying Ren Wei. Thus, her decision to marry Ren Wei, actually was not for her mother, but for herself. Ai Xing did not want Jing Jing to go along with the flow with the amnesia problem, she wanted Jing Jing to stand up and tell the truth. Can you stop being selfish this time? [This is in reference to Jing Jing having her cake (Ren Wei) and eating it, too (Tian Ze)]. Give us your blessings this time. If everyone makes concessions in love, everyone can live happily ever after. EXACTLY. And she’s probably jealous that Tian Ze seems even happier with Ai Xing than he was with her. 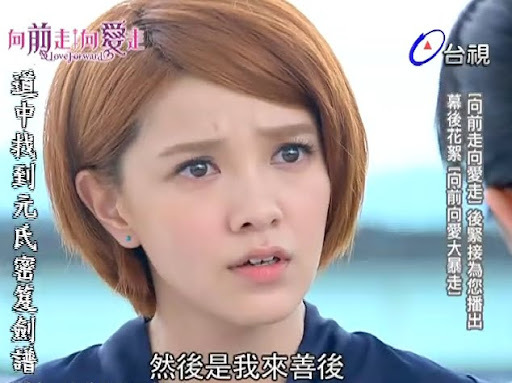 Ahaha I cracked up when you said “Ahem” right underneath the screenshot of Ai Xing’s angry face. Yeah, Ai Xing shouldn’t have to feel guilty about liking Tian Ze. Jing Jing blames Ai Xing like she could just magically not have feelings for him or something. What the heck, Jing Jing? And what makes me even madder is that Jing Jing looked shocked and offended when Ai Xing snapped back at her, like she expected Ai Xing to just submit and apologize. I think it’s really unnecessary to explore Ai Xing’s parents’ past…it’s too late to suddenly introduce her dad into the picture. 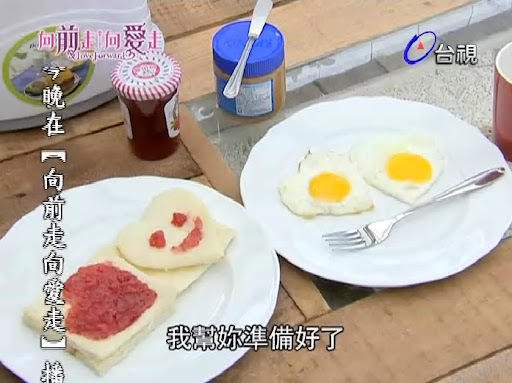 Yep, Jing Jing is jealous that Ai Xing is living the life she wanted and Tian Ze is HAPPIER for it. Take that Jing Jing! I think that the main problems stems from Jing Jing's frequent flashbacks to Tian Ze's and Ai Xing's very deep and natural friendship in which so many people construed that they were a couple (that we all wished was more). Since Ai Xing and Tian Ze are so happy, does that mean that all those insecurities were right? Instead of Jing Jing understanding that her two besties belong together, she seems to have this anger directed at their relationship as if she was lied to or betrayed, and she wasn't. I think Ren Wei was right, if things had been different and Tian Ze hadn't fallen head over heels for Jing Jing, Ai Xing and him would have been a couple quite a while ago. Ah, just think about all that wasted time being hung up on a first love that went nowhere. Yeah, Jing Jing had no right to be offended. Surprised, maybe, offended, no. She deserved it and I did a happy jig and was egging Ai Xing on. Jing Jing knows how important she is to Ai Xing right? So why couldn't she keep her mouth shut and be supportive? When push comes to shove, even the loyal Ai Xing has a breaking point and her reasons were all valid and Jing Jing's excuses were all just that – very feeble excuses and NOT 100% valid reasons. I also think that their friendship is horribly unbalanced. Jing Jing sure has done some nice things for Ai Xing, but its always Ai Xing doing things for Jing Jing with Jing Jing not giving anything in return. That is a very one-sided friendship. SO if Ai Xing doesn't always support her? I'd say Jing Jing deserves it because she's using Ai Xing more and more instead of treating her like a true friend. At this stage of the game, yes, they shouldn't focus on the big family secrets that they've been hinting at forever. But you know they'll use this, it'll take up a good chunk of time and then we might get that horrible rushed ending that I hate. Although I really hope not. Exactly, it’s like Jing Jing thinks she deserves Tian Ze’s love, but Ai Xing shouldn’t even dream of it. I really want Jing Jing to support Ai Xing’s dream for once. She needs to step up and be the better person by swallowing her pride and gracefully letting Ai Xing & Tian Ze get together. That’s what I’m scared of–a RUSHED ENDING. I dread a rushed ending. I feel like it will be rushed because the episodes have been dragging for a while. I really have no idea how they’re gonna resolve this mess within the next few episodes.